Do you want to turn your artworks or original paintings into fine giclee canvas prints? Superchrome, one of the most prestigious large format digital printing companies based in the UK, will help you to create true and appropriate reproductions of your original artworks or paintings as giclee canvas prints. Superchrome giclee canvas prints will definitely rival original works of art in their beauty and color accuracy. Recognized as an expert company in the giclee canvas printing field, Superchrome can offer full service giclee canvas printing services to both amateur and professional artists in the fine art business. The color accuracy and depth of details of our giclee canvas prints are exceptional when compared to traditional printing. At Superchrome, we can create amazing giclee canvas prints from either your original work or a scanned image. They are very useful for creating limited edition fine art reproductions. We have a team of highly experienced and talented giclee canvas printing experts who have profound knowledge in the art, color theory and the tools required to reproduce the original art. They produce quality giclee canvas prints with the aid of high resolution, wide color gamut printers. We have state-of-the-art giclee printing technology to provide the best possible image reproduction. 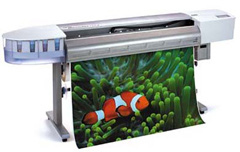 We utilize most modern and the finest large format giclee printers such as Epson, Mimaki, Mutoh, Hewlett Packard and Roland in our giclee printing department. Artist grade canvases we use for giclee canvas printing are water-resistant, highly resistant to cracking and are highly compatible with pigment based inks. We use archival inks such as Epson Photo Dye, UltraChrome, and Epson Archival Standard to achieve stunning, museum quality giclee reproductions. In addition to canvas, we use various other types of media such as watercolor paper and archival adhesive paper for giclee printing. Transform your favorite painting into stunning giclee canvas print. It will be a truly beautiful addition to your home or office environment. If you have any questions regarding our giclee canvas prints, give us a call or send us an e-mail. We are also available to assist you through our online live chat system.